Ebay is yet another giant consumer brand that has fallen victim to a cyber attack. Like many of us, I raced to change my password when I heard the news break early Wednesday morning. Of course the news media and many eBay users assumed the worst had happened and that personal and financial information had been breached. Fortunately, the attack was limited to a corporate network and only a small amount of employee login credentials were breached. EBay’s PayPal business unit did not show evidence of user personal or financial information being exposed. Few. Yikes! What are consumers to do?! Even the perceived most secure websites, businesses and financial institutions are vulnerable to cyber attack. I think the best form of protection is to empower consumers to control when, how and where their credit or debit card data is used. If consumers can limit the use of, “turn off” or block the use of a card, they are empowered to protect themselves from any resulting damages from these cyber attacks. The eBay cyber attack highlights the consumer value of Ondot solution Imagine that you were a victim of a data breach and that your credit card information may have been sold on the black market. Sadly, this is the case for millions of US consumers. The Ondot solution empowers you to prevent any fraudulent transactions should a fraudster purchase your data and attempt to buy things on or offline. For example, upon hearing about the breach you could easily turn off the card immediately giving you extra time to determine if it’s necessary to cancel the card. Or, if you limit card use by geo proximity to you, use of the card will be denied to any cyber criminal across the world attempting to purchase items. You are empowered to protect yourself from fraudulent payments BEFORE they even happen. That’s cool. Ondot Systems does not provide a direct to consumer solution. They are actively pursuing relationships with the major payment processors and financial institutions to white label the technology. I’m wondering though if this technology is relevant enough that consumers could actually ask their bank card providers for it….or be willing to switch to a card provider who has this technology deployed already. The Ondot solution could prove to be a strong differentiator that may attract many new customers to a bank’s credit card offering. With the increase in data breaches, I’m hoping my bank will provide this functionality soon. If not, I am open to learning more about who does offer this technology. Ondot has the wind at its back now. However, this technology is not new and competitors have built similar solutions. From what I understand from my patent attorney friends, this technology is not particularly defensible for there are many ways to skin that technology cat. Meow. Ondot must build strategic partnerships with the largest payment processors first to grow market share…and do it quickly. These processors will pave the way to deploying to small and mid tier banks. Ondot’s big hurdle will be in how easily the solution is deployed at the bank. As we know, these smaller banks get heartburn if a solution integration requires a big internal commitment. However, it appears they have addressed this hurdle with seamless integration into the universally accepted payment standard and with deployment support. Once deployed, Ondot’s next challenge will be in how well they engage these banks in co-marketing the solution to the consumer. Many mid and lower tier banks run lean on marketing so the key here will be how to take advantage of current marketing channels to drive adoption. However, I have a feeling consumer word of mouth may be the most effective channel. Ondot is a formidable competitor and is well positioned to be the market leader. Now it’s about how well they execute. Like a good citizen of the FinTech community, I downloaded the major payments apps to my iPhone including PayPal, Square and Dwolla. I also searched for opportunities to add loyalty cards to my phone’s Passbook. I deposited a small amount in each payments app and added my Starbucks card to Passbook eager to make a payment with my mobile device. Unfortunately, each of these payments apps and features remain unopened after a year from downloading. I have not been successful in finding stores in my local area that accept payments from Square or PayPal or have a loyalty card compatible with Passbook, aside from Starbucks. To make matters worse, I typically just open up the Starbucks app directly and avoid Passbook all together! Clearly the mobile payments or wallet value chain is broken and innovators are struggling with defining how customers and businesses want to use the mobile device to drive their purchases. Those of us who follow FinTech closely are well aware of the struggle for defining the mobile wallet correctly. “Wallet” is a loose term these days. Most people believe payment apps are wallets even though a wallet typically includes feature or cards beyond just payment tools. If this wallet perception is true, then why are apps like Square and PayPal NOT the driver of mobile wallet ubiquity? I think getting closer to the correct definition of the mobile wallet requires us to pay close attention to what’s happening at retail…specifically at the fast food franchise level. National fast food chains such as Burger King and Wendy’s are launching mobile apps that enable customers to order and pay for food using a credit card. These apps are retailer specific mobile wallets that will enable the brands to build deep customer relationships by understanding buying patterns to then reward customers with specials offers and discounts. Frankly, I’m a little surprised it has taken the fast food guys so long to build and launch these apps. Starbucks has been doing this for over two years. Over the past few years Starbucks has clearly won my loyalty as they guide my purchasing through bonus star offerings. There are significant implications for mobile payments innovators if the Burger King and Wendy’s apps are widely adopted and are successful in generating more revenue and creating deeper customer relationships. First of all, consumers are saying they want brand specific apps that enable them to pay and reward their loyalty. Think the Starbucks app. These mobile applications are essentially loyalty cards. Secondly, consumers are also saying they are willing to pay with their credit card through the application…and don’t need a new payment platform. For example, the Burger King and Wendy’s applications require the consumer to enter in credit card information upon sign up to make purchases. The consumer makes purchases on the same Visa, Mastercard or AMEX platform used to make all their online and offline payments. These mobile payments will also be covered by the policies defined by each credit card to protect against fraud. Given the entrenched credit card payments system and fraud protections, there is really no consumer need to sign up and manage another payment platform. Brands and retailers will be monitoring closely the success of these fast food applications. If these applications continue to be effective payment empowered loyalty cards, what role does the mobile device play? Similar to a real wallet, the mobile device is the holder of the many branded loyalty and payments apps. Does this put the mobile devise in a unique position should these retail brand specific apps be successful? Yes, for the mobile device IS now the mobile wallet. No one should have a heart attack and die from digesting this concept. It’s nothing new and is a recurring theme a several mobile payments conferences. Daniel Mattes, the CEO and founder of Jumio, articulated his vision for the mobile device as a wallet at Money2020. However, there has been such focus around the mobile wallet being an individual application that many people think of Square and a few others as being wallet innovators. This is starting to change as people digest what Apple may be doing in the payments space. Thinking this through, Steve Jobs may have had a similar vision. 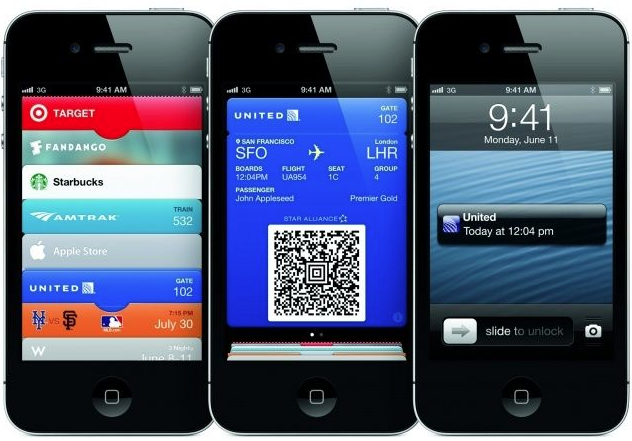 Passbook is a feature to store tickets and loyalty cards. It’s not a stretch to envision storing encrypted credit card information and ID on the device. I think it’s safe to assume that Apple will not be entering just the payments business….but will most likely be defining and enabling the iPhone to be a true digital wallet. Expect Samsung to follow a similar strategic path. The big question will be how long it will take for the mobile payments vertical to evolve to this point. A lot of money has been invested in Square, Flint and PayPal to invent another platform. However, Visa and Mastercard will be active and well funded suppliers in the mobile payments war. It will be a matter of time until the right mobile device features emerge that enable the major credit cards to easily plug themselves in to mobile transactions. Once the right device feature emerges, the mobile payments vertical will be locked up quickly. Unfortunately, this means many payments apps will become part of those “hey, do you remember….” so common at cocktail parties. Can Apple Benefit from a Strategic Partnership with PayPal? The fact that Tim Cook hinted that Apple might be getting into payments is no surprise. It’s more of a “duh.” Apple has the user accounts, consumer credit cards on file, and millions of iPads and iPhones in market. The launch of Touch ID and the iBeacon sensor only connect the dots even further. Apple’s Passbook paves the way for expanding the wallet beyond loyalty cards and into the ability to make online and offline payments. The launch of the Touch ID addresses security concerns and helps prevent unauthorized payments should the phone, or “wallet”, be lost. In the online world, it’s not a far stretch to imagine a consumer using their Apple ID to authorize a charge to their credit card for a purchase made on an e-commerce site. However, competitive pressures from Visa, MasterCard, and PayPal may make convincing e-commerce sites to accept Apple payments that much harder. One recent article points to Apple making payments as part of the iOS developer kit…which would easily provide code needed for a developer to add a payment feature to their mobile commerce app. However, the opportunity for Apple gets more challenging in the offline retail world. Yes, iBeacon creates a network to enable mobile payments through detecting and authenticating a mobile device. Cool. However, Apple faces the challenge of convincing merchants to adopt the payment processing hardware, dongles, etc. Google, Stripe, Square, and Dwolla also face this problem, among others. Even with its big brand recognition and marketing strength, Google was not able to grow offline retail adoption of its wallet. So what are the opportunities for Apple moving forward? Apple could build its payments business through acquisitions, or strategic partnerships. Square has been a leading innovator in the payments space, is building merchant adoption and has a strong focus on UI/design given their recent hardware release. While a Square acquisition may be expensive, Apple would quickly acquire payments processing technology, a growing user base of merchants and a design focused group of developers. Bloggers have also identified Stripe as a potential, less expensive acquisition. I think Apple can benefit the most, however, from a strategic partnership with PayPal. Recently a LOT has been written about PayPal feeling the heat from Apple and pitching to help build out their payment network. Some people see this as a signal PayPal is feeling threatened. Yes, the competitive threat is there. However, PayPal has many elements that Apple needs to be a leader in this category. I think together, PayPal and Apple can create a break through wallet that defines the mobile wallet. First of all, PayPal has addressed many of the cross-boarder (currency) trade challenges that Apple will eventually face. Remember, Apple products are ubiquitous and they face hurdles in every new market they enter. We all know that Apple will not want to limit payments to the US market. Secondly, PayPal has a merchant program in place and is regularly improving the product feature set. This in market learning will only improve PayPal’s ability to deliver a solution merchants actually want and can easily adopt. PayPal is also co-marketing with merchants to drive consumer adoption. Lastly, PayPal is seen as the “most trusted” mobile wallet brand as defined by a 2013 Javelin study. Why is this important? In light of the recent data breaches, mobile security will be a big factor for not only consumers, but for merchants. Yes, Apple’s fingerprint ID is fantastic to access the device and authorize transactions. However, there is a lot happening in the payment processing back-end that PayPal has focused on securing for almost 20 years. A partnership with PayPal will enable Apple to address this hurdle and avoid a dreaded data breach. Should the unthinkable actually happen, culpability would most likely NOT fall squarely on the shoulders of the world’s number one brand. This week I had a conversation with an executive at a mobile banking company. We spent a majority of our time discussing the strategy of using strategic partnerships to build a customer base, deliver products that meet customer needs and generate revenue. This executive shared an unfortunate experience where his team was pushed into a partnership where they provided most of the product development resources and had to commit to the lion share of the marketing spend to promote. Unfortunately, the double barrel commitment yielded little return in helping the company achieve its goals. The partnership was more of a distraction and had high opportunity costs. Frustrating. Strategic partnerships are an important lever to pull to grow revenue, drive acquisition, build out technology, and increase product functionality. However, it’s mission critical that the right strategic partnerships be established or the relationships will be a distraction and take critical focus off of what is important. One of the most important exercises a company must go through is to understand who their customer is and how the company will meet customer needs. Without this understanding, it will be impossible to find the right strategic partnerships. Once the customer is understood, companies need to evaluate potential partners across 4 factors. The first factor is access to the right customer. Will the partner enable a company to market their product to a customer segment that will generate revenue and have high life time value? If not, the partnership will yield access to consumers whose needs are not met. As a result, little value will be provided to the company. Unfortunately this happens far to often as young companies rush to find ways to acquire new users and monetize as quickly as possible. As we all know, this is a symptom of a short-term focus and a need to show growth to current and would be investors. The second factor is to understand the required investment needed to realize the value of the strategic partnership. For example, eBay entered into a strategic partnership with PayPal to meet the needs of its users to pay for things securely online. Yes, eBay had to invest product resources to integrate the PayPal technology into its listings. However, the investment had a very positive ROI for it brought huge value to eBay buyers and sellers. The product partnership proved to be very successful, as we know, and eventually resulted in eBay acquiring PayPal. The third factor is the company’s internal resources and willingness to support the partnership. I’ve seen many companies stumble on this factor. I was part of an organization that needed to partner to quickly provide product features to remain competitive. It was one of those standard “make vs buy” debates that resulted in the executive team deciding to move forward with a partnerships strategy. Unfortunately, employees outside of the executive committee did not feel they had the resources needed to support any technology partnerships and quickly dug their heals in and resisted any discussions. Needless to say, any partnership agreements quickly stalled in the implementation process. The last factor is both parties’ shared interest in a successful outcome. The partnership must be of equal or greater strategic importance to both partners. While at Excite@Home I managed a strategic partnership with Paramount Pictures that was designed to increase awareness that Excite was a destination to learn more about the latest blockbuster movies. I managed a team of developers, designers and marketers to build solutions to promote Paramount’s movies across the Excite@Home network. We busted our butts to get things done. Unfortunately, Paramount didn’t have much interest in promoting us as defined in our partnership agreement. We were lucky to get an Excite@Home logo placement on the front page of the Paramount website…but were nowhere close to receiving any offline placements. Paramount reminded us of this too frequently. Such is life in the big city. It will always be Silicon Valley vs Hollywood. So blah. What is the conclusion to my bloviation? Before company executives start frothing at the mouth to strike strategic partnerships, it’s important to do the introspective work first. Who is your customer? What customer needs are being met with the product? What needs are not being addressed by the product? Only with this sense of corporate self-awareness can companies enter into fruitful strategic partnerships. Without doing the upfront work first, it’s like searching for a spouse without knowing what qualities one is looking for in a mate. 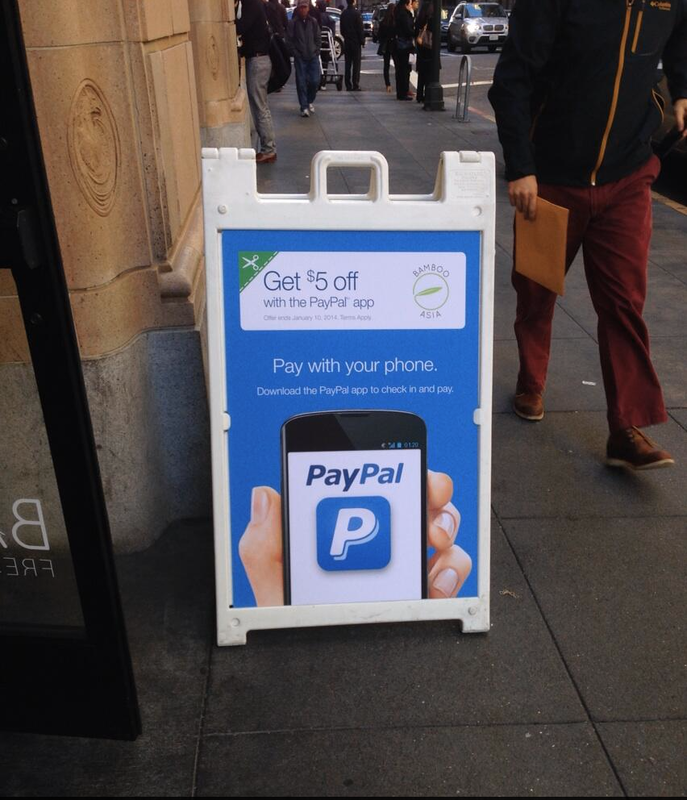 As I walked through the Financial District in San Francisco last week I came across one of the oldest forms of marketing promoting the newest way to pay for something; a sandwich board offering $5 off for customers who pay using PayPal. 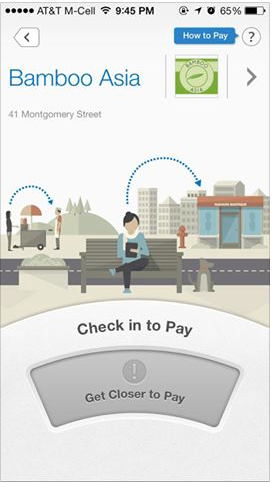 I did a double take when I saw the PayPal logo for most restaurants promote their relationships with Yelp, Foursquare or OpenTable…let alone promote the use of a mobile payment tool. I’ve seen very minimal payment tool promotion beyond what Peet’s is doing to promote their relationship with Google Wallet. As we all know, Google Wallet has gained little traction. I ducked into the restaurant, Bamboo Asia, to get the special offer that required me to pay with the PayPal mobile app to receive $5 off my purchase. I ordered a Bhangra Bowl and a tea. I opened the app on my phone, paid and received the discount. Cool. It was easy. Clearly Bamboo Asia is part of PayPal’s merchant payments pilot program and has been provided incentives to generate consumer awareness and drive app downloads. PayPal has an up-hill battle here for there are other payment solutions, such as Square and Dwolla, who are competing for awareness and consumer wallet adoption as well. The $5 off purchase offer may help PayPal increase trial, but it falls down at driving repeat use. This week I went back to Bamboo Asia and used the PayPal app to pay. The restaurant manager said, “Oh, the discount is one time only.” “No worries…I still want to pay using PayPal,” I replied. The manager looked at me like I had a booger hanging from my nose. “Why would you want to use the app again without the discount?” That statement points out the importance of not only increasing adoption, but also providing reasons why consumers should continue paying with the mobile wallet. Unfortunately this store manager was only focused on the immediate discount offer and didn’t really see a benefit if his customer base continued to pay with PayPal. Bamboo Asia customers were also not provided a reason to pay with PayPal either. This should be concerning for PayPal for two reasons. First of all, the merchant will see a spike in sales for the short term, but will not see a continual lift from repeat customers. In this case, consumers downloaded the app just to get the discount. The merchant may wonder why he participated if none of the PayPal app users become repeat customers. Secondly, PayPal is driving downloads, but not demonstrating to customers the value in continuing to pay with PayPal…which leaves the consumer mind share WIDE open for a competitor to tell consumers WHY they should pay with a mobile payments tool. What do PayPal and the merchant need to do as a follow up to the “download the app” discount program? Offer incentives for consumers to continue to pay with PayPal. Maybe Bamboo Asia offers special deep discount offers to users who use the app to pay 10 times? Or, maybe PayPal creates a consumer loyalty program that offers points every time a consumer uses the app to pay for anything at a restaurant? OpenTable followed a similar strategy by rewarding their customer base with 100 points for each reservation made through their service. I believe the customer is sent a check or discount coupon from OpenTable to spend at a restaurant of their choosing. Given how crowded the mobile wallet space has become, it’s clear that consumers need an incentive to adopt a solution. PayPal has the right brand awareness in the B2C and B2B space. The big question is how PayPal can make it easy for merchants to use their mobile payment tools. A second factor to success will hinge on what co-op marketing programs PayPal can build out with merchants to provide incentives for consumers to pay with PayPal. PayPal, the field is wide open now. You’d better act fast or the teams at Square and Dwolla will get there first!